Choose one of five shapes. Rectangles and squares have rounded corners. This polypropylene material (similar to mylar) is suitable for most applications. It is 2.6 Mil in thickness with a permanent adhesive. This material is impervious to water and oils and is particularly suitable for bath and body products as well as food containers. It is white and somewhat opaque, but may not be opaque enough to cover high contrast text without dark ink printed on it. This is the clear version of the Polypropylene (BOPP) material. It has the same waterproof qualities as the White BOPP, but on a 2 Mil clear material with permanent adhesive. It provides more of a "no label" look and is suitable for window stickers. When using this substrate, it is common to back all printing with White Ink since digital color inks themselves are about 50% transparent. The white vinyl is 3.4 Mil thick with a permanent adhesive and is very substantial. It is suitable for applications where greater strength and durability is needed or where lengthy exposure to the elements is an issue. For outdoor use. It is white and more opaque than white BOPP, but it may not be opaque enough to cover high contrast text without dark ink printed on it. This is a great option for wine labels, gourmet foods or high-end beverages. Being a white paper stock, it's not as water-resistant or durable as BOPP but does feature a permanent adhesive. For more information on Roll Labels, please click here. Roll labels can be a very interesting advertising solution. 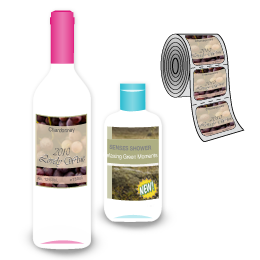 If you want to give your customers a present for christmas, for example, with with roll label printing you are able to customize wine bottles, choclate oder any other item. Your customers will receive a unique present for christmas that proofs your care and creativity. Roll labels printing can despite from this also be used to label glasses, boxes or other items. With a roll label your able to personalize the things that surround you and create an amazing effect. Roll label printing is not as difficult as most people think that it is. With printsafari.com customers have excess to a very special and reliable service offering the highest quality. Printsafari customers can choose from different sizes, colours, shapes and materials. This variety of options is part of why so many people are satisfied with printsafari.com. The Roll labels printing solutions we offer do really make a difference. But Roll Labels can also be used for private purposes. For example when you are cooking marmelade and you want to fill it into little glasses to give them to your friends. Roll Labels can be very helpful to organize activities like that. Design your own Roll Label and order it at printsafari.com.